The hardest thing about retiring from Williams was clearing my office of 34 years’ worth of accumulated stuff. It wasn’t just the volume of papers and books that I had to contemplate whether to save or to toss. It was the emotional, archeological experience of sifting through the objects and artifacts that represented my life. And yet, apart from the tedium, the process turned out to be thrilling—particularly the forgotten relics of my youth! (No, I’m not going to post that photo of me at age 28 partying with the Marine security guards at the US Embassy in Moscow.) I donated the most interesting documents to the college archives and dumped quite a lot into the recycling bin—which means in a way I recycled everything. 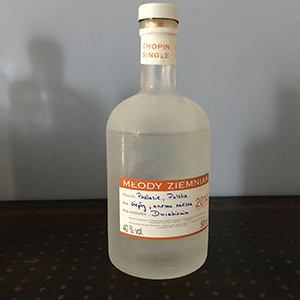 I sometimes think I could write my life story through all the bottles I’ve accumulated over the years, from all sorts of vintage Stoli (I was a spokesperson for Stolichnaya vodka in the mid 1980s) to my latest esoteric favorite, a small-batch Polish vodka that’s been distilled only once to preserve its wonderfully earthy character. 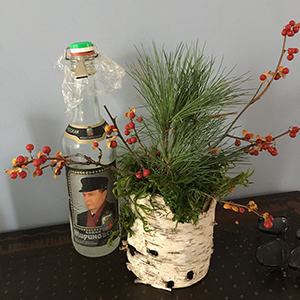 (This bottle was produced in 2014—a warm year, the label tells us, with an early spring.) 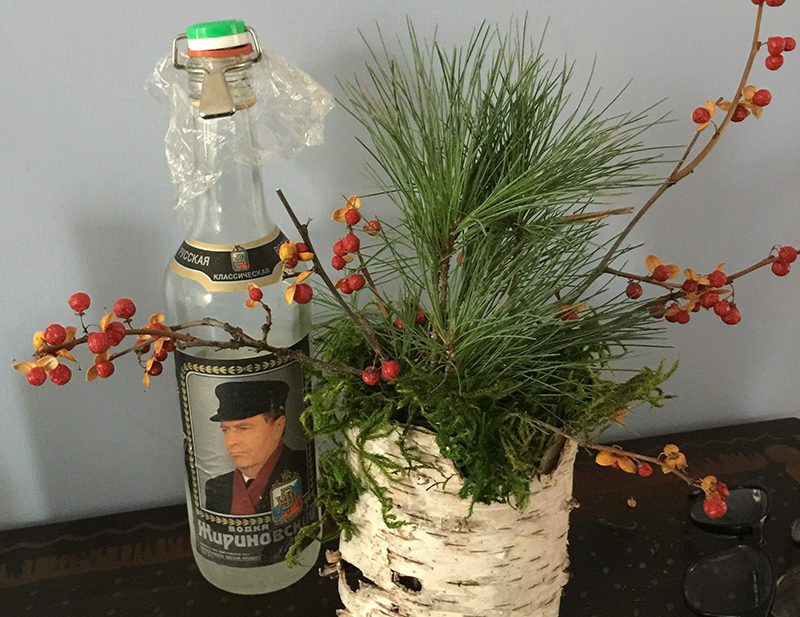 I also discovered a bottle of “Zhirinovsky” vodka from 1995, branded with the face of the nationalist politician Vladimir Zhirinovsky, a Russian Mussolini who sought the vodka vote for his (failed) 1996 presidential campaign. Though the vodka wasn’t very good, I saved the last drops and plugged the bottle with plastic wrap and a stopper so that they wouldn’t evaporate. Did I need to keep this bottle in the freezer? No, but at least it doesn’t get dusty in there. My most recent acquisitions represent new history rather than old: vodkas brilliantly flavored by Cortney Burns, the former chef at San Francisco’s Bar Tartine who’s now orchestrating the food for the Tourists Welcome resort that will open in North Adams, MA, in Summer 2018. 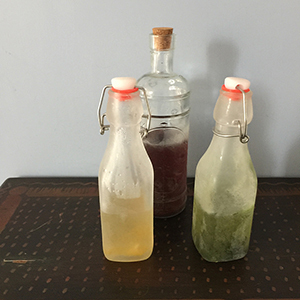 Here you see vodkas flavored with fennel and goldenrod, and the amazing smoked purple barley infusion Cortney devised for my retirement party to celebrate the Purple Valley where we live. Why peanuts? In Russia, pickles are the favorite chaser for vodka. There’s caviar, too, which, surprisingly, was once a common bar snack in the US, its saltiness an enticement to order more drinks. In the early twentieth century, Atlantic sturgeon was so plentiful in the Hudson River that we even exported the roe to Russia. Now, of course, Atlantic sturgeon can barely be found, and bar snacks are pretzels or peanuts. 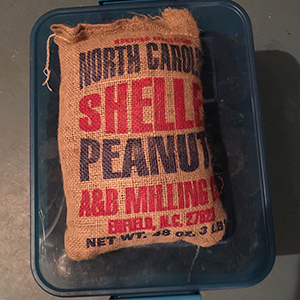 These peanuts from Aunt Ruby’s in eastern North Carolina are my absolute favorite. I keeps cans of roasted and salted ones in the pantry, but I like to have raw peanuts on hand in the freezer, for making peanut brittle or popping into oil for stir-fries. I discovered Aunt Ruby’s decades ago when my family rendezvoused every summer at the North Carolina shore. An easy one to explain. 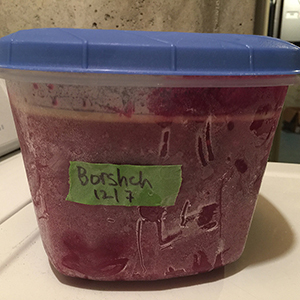 Here’s a bit of my current history, two different batches of borscht from recipe testing for my new Russian cookbook, which Ten Speed will publish in 2019. The good thing about borscht is that it makes a lot—you can easily serve a crowd. That’s also the bad thing about borscht when you’re recipe testing—you end up with too much, even after you’ve already given away most of the first batch. 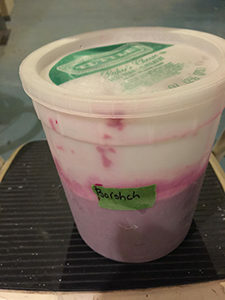 Still, I love being greeted with the soup’s vivid garnet whenever I open the freezer, so I keep these big containers right in front, meaning that we have to rummage to find what might be hiding behind. Parts? 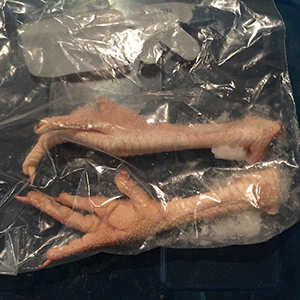 Chicken feet lend rich flavor and a wonderfully gelatinous texture to chicken stock, which can be lackluster without them. These came from Red Shirt Farm in Lanesborough, MA, about 25 minutes down the road. 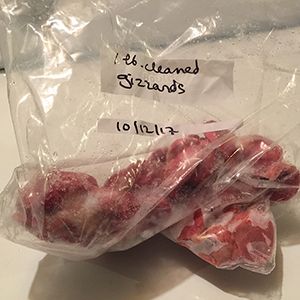 But my favorite part of the bird is the gizzards. I recently perfected a recipe for them, braising them in dill pickle brine and adding just a touch of sour cream to finish. Heaven! These beautiful specimens came from Square Roots Farm in nearby Cheshire, owned by a former student of mine, Michael Gallagher, who majored in Biology and Russian. He took my senior seminar on Russian nature poetry. I’d sometimes hold class in the woods, and we’d recite poetry as we observed the plant life. What could be more Russian than that? My department threw me a fabulous party at the Williams College Museum of Art, complete with a show-stopping cake crafted by Ron Ben-Israel. 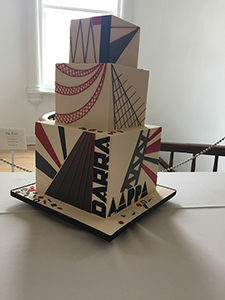 Ron modeled the cake after the Russian Constructivist Vladimir Tatlin’s 1920 Monument to the Third International, looking toward a radiant future—a lovely metaphor for my send-off. Though it was impossible to recreate the monument’s intended iron fretwork and its leaning axis (a cake is, by definition, solid, and you definitely don’t want it to topple! ), Ron stunningly captured its spirit. 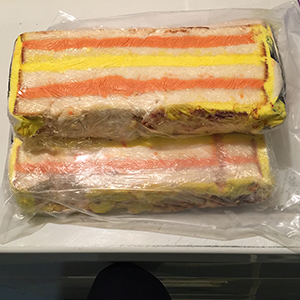 Only a few slices remain, still vibrant with their passion fruit and blood orange buttercream fillings. I always know exactly where they are.